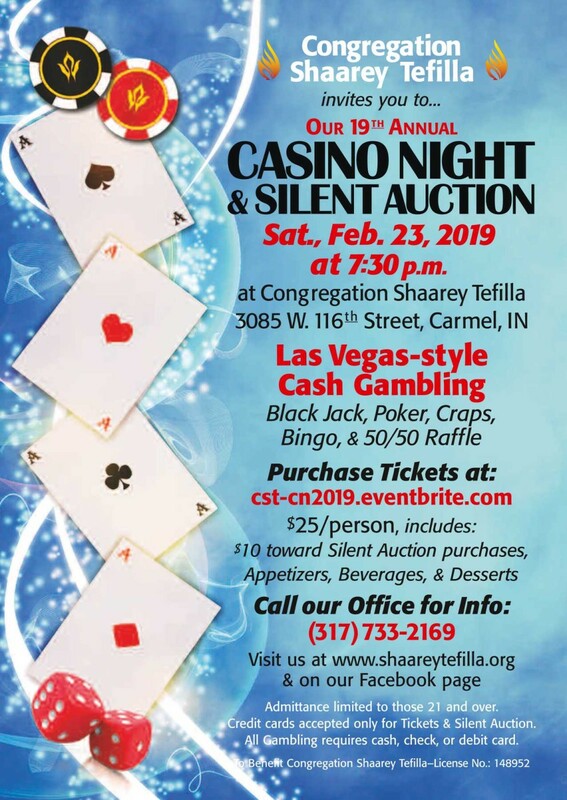 Casino Night and Silent Auction at Shaarey Tefilla | Jewish Federation of Greater Indianapolis, Inc. Play the odds with Las Vegas-style cash gambling—blackjack, poker, craps, bingo, and a 50/50 raffle. Bid at our Silent Auction on our amazing items. Ticket price includes $10 toward Silent Auction purchases, appetizers, beverages, and desserts. 21+. Credit cards accepted only for tickets and Silent Auction. All gambling requires cash, check, or debit card. License no. 148952.